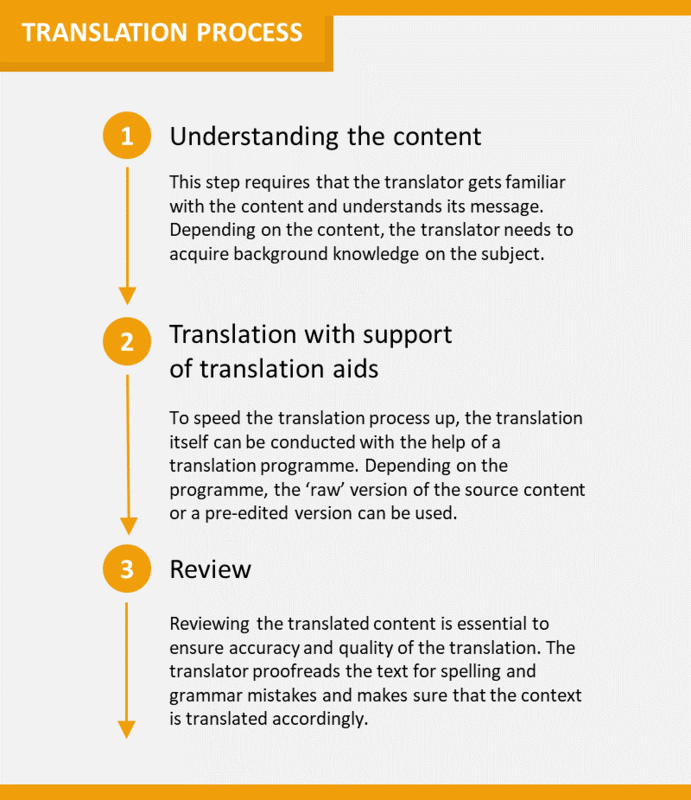 How can a company achieve high-quality translation adapted to the local market? In today’s world, there are real choices for translating your website. 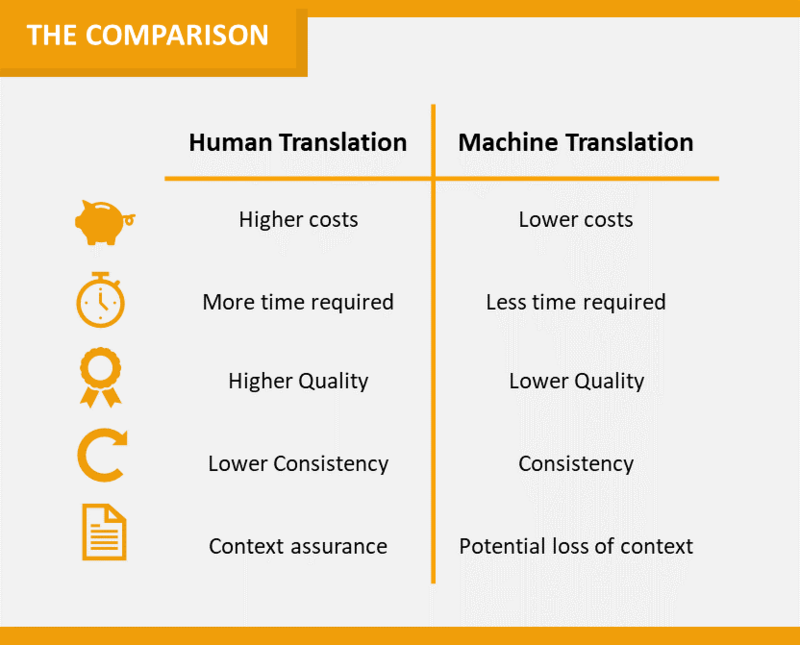 The translation can be done by humans or through machine translation. In-house translations by employees of the export market, external translation agencies or online programs are all options for translating your website. If you don’t have in-house translation experts, you can outsource it to a huge variety of service providers. Smaller companies with limited resources and knowledge of language and markets, may find using external providers is essential to provide a high-quality content on the website. Another key element for quality is consistency. Human translators tend to use a variety of words instead of sticking to one standard glossary. That lowers the consistency of the translation, which has potential misunderstandings of terms as consequence. Increasingly, the best practice attempts to combine the advantages of both translation options. Acquiring knowledge on the subject, potential pre-editing and proofreading can be conducted by the translator, while the actual translation process is carried out by the software. The first option represents the translation by a professional translator. But how can you decide who is the right person for your content? Create a sample text for a short part of the translation, including the most important technical terms. Then, a variety of professional translators can be tested. Afterwards the text can be proofread by a subject expert in your target market (e.g. a retailer or partner of your company) and the best translator can be chosen. This process can be expensive and time consuming the first time but ensures high quality translations for the future and prevents misunderstandings or bad impressions for potential customers. 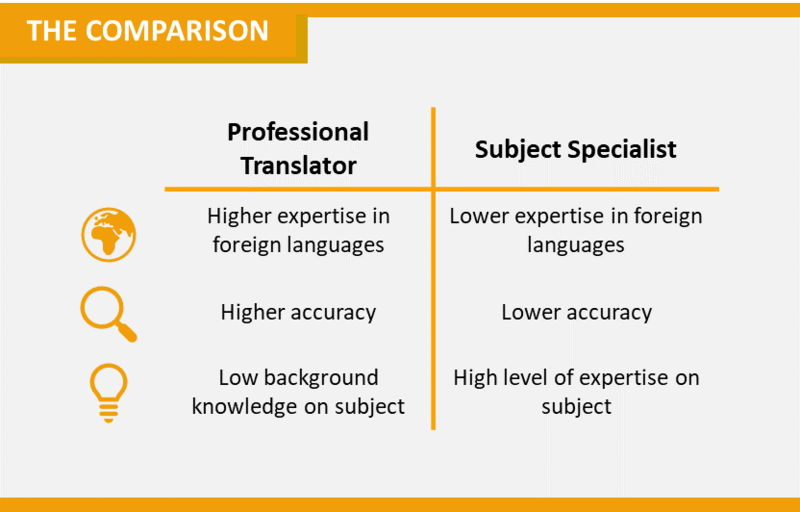 When consulting a subject specialist for the translation, the choice should be made after language expertise. The specialist should speak at least two or three foreign languages fluently in order to make an adequate translation. If the process deviates from the regular translation process, guidelines on the process and other remarks can be established. To ensure a consistent use of terminologies, a glossary can be set up. The glossary should include correct translation of frequently used or important words. Once established, it can be reworked and extended on a regular basis. The database can be used in addition to the glossary. Besides single terms, the database provides previous translations on the subject, definitions and application examples. That makes it easier for the translator to see how terms and sentences have been used before and increases the consistency. Furthermore, articles and existing content on the subject can be provided to increase the background knowledge of the translator. If your company wants to expand into different markets, with different measurement systems, you need to be aware of these. It is important to know, whether the target market uses the metric system, United States customary system or the imperial system. Furthermore, the conversion should be conducted properly. A list of measurements for each market can be added to the database. Want to learn more about how to use language successfully within the online internationalization?